Terlipressin (lysine-vasopressin) acts like endogenous arginine-vasopressin through vascular (V1) receptor and causes systemic vasoconstriction. ,,, It is widely used in the treatment of bleeding esophageal varices for its lesser cardiac side-effects than vasopressin. However, unlike its effect on systemic vasculature, its effect on coronary vasculature is unpredictable. We report a case of left ventricular (LV) failure and LV posterior wall hypokinesia following terlipressin injection. A 45-year-old woman presented to our hospital with hematemesis. She had a history of poorly-controlled type 2 diabetes-mellitus for 10 years (HbA1C 7.4%), hepatitis C related cirrhosis and portal hypertension for 2 years. In the emergency department, she was conscious, hemodynamically stable (heart rate: 90/min and blood pressure: 110/70 mmHg), and had normal respiratory rate (RR): 18-20/min, chest X-ray and electrocardiograph (ECG) [Figure 1] were normal. In view of her low hemoglobin and suspected on-going gastro-intestinal variceal bleeding, terlipressin 4 mg was administered intravenously over 2 min to control bleeding and simultaneously esomeprazole infusion was also started. She was monitored with ECG. 20 min after the administration of terlipressin, the patient complained of dyspnea and increase in upper abdominal pain. Concomitantly, ECG showed significant ST depression in inferior leads [Figure 2]. She was immediately transferred to the intensive care unit (ICU). She appeared anxious, tachypnic (RR: 40/min.) and had tachycardia (130/min) with high blood pressure (150/80 mmHg). Basal crepitations were heard bilaterally on chest auscultation. Transthoracic echocardiogram (TTE) revealed LV inferior wall hypokinesia, with ejection fraction (EF) of 38%. Her cardiac enzymes were within normal range. Moist oxygen inhalation, furosemide (0.5 mg/kg), fentanyl (2 μg/kg) were administered and nitroglycerin infusion was started at 0.5 μg/kg/min. Esomeprazole infusion was continued and octreotide infusion was started. Within an hour, ECG normalized. 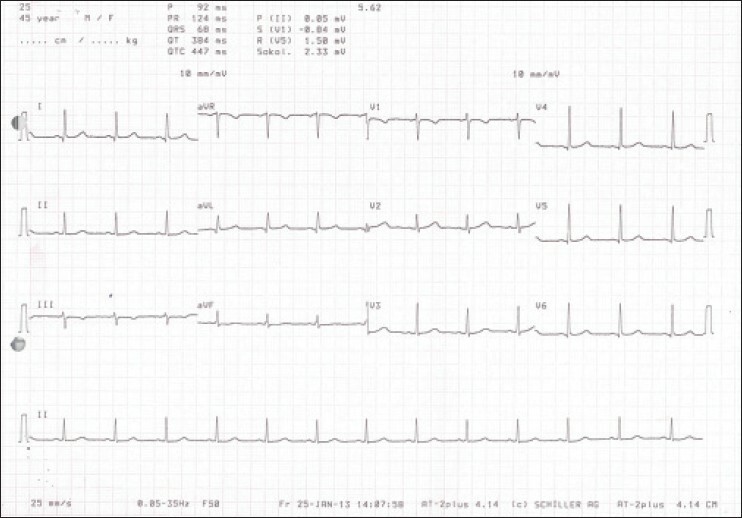 Repeat 12 lead ECG (after 2 h) was normal. Serial cardiac enzymes were within normal range. Repeat TTE after 6 h showed improvement of left ventricular ejection fraction (LVEF) to 58%. Coronary angiogram was deferred in view of normal enzyme levels and normalization of ECG and TTE. Later upper gastrointestinal endoscopy was planned and the patient was transferred from ICU. This case report describes a relationship between intravenous terlipressin and severe LV failure and LV posterior wall hypokinesia in a patient of bleeding esophageal varices. 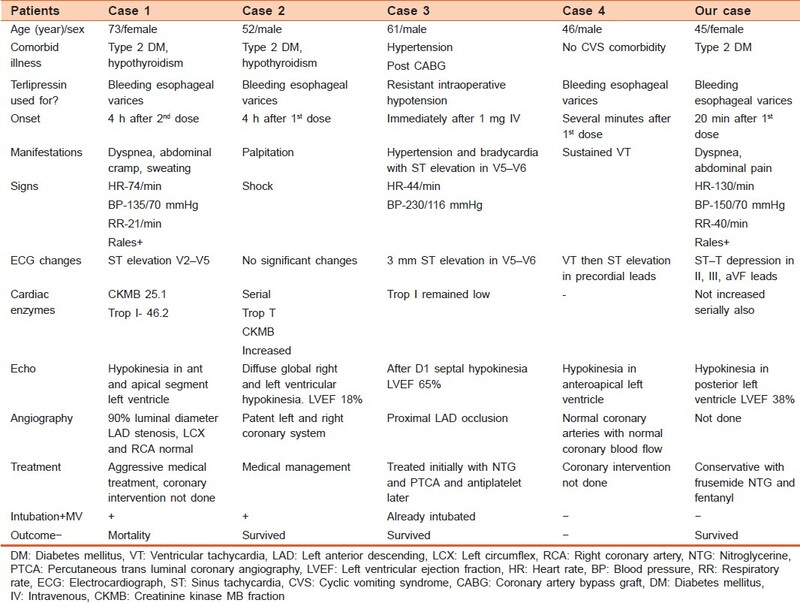 Literature search revealed four case reports of severe cardiovascular complication after intravenous terlipressin injection [Table 1]. ,,, However, compared to the reported cases, perhaps, ST-depression was detected early in our case due to ECG monitoring. Interestingly, except one case, coronary arteries were normal during angiography in remaining three cases [Table 1]. Terlipressin acts through selective V1 agonism (V1:V2 ratio is 2.2:1 as compared to vasopressin 1:1) and causes vasoconstriction. It reduces portal venous pressure through V1 mediated splanchnic vasoconstriction. In addition, terlipressin does not increase plasminogen activating activity and optimize hemostasis. It may have V2 receptors mediated vasodilatory effects possibly by nitric oxide liberation. In the coronary circulation, terlipressin can cause vasodilation or vasoconstriction depending on endothelial nitric oxide levels. , Because of structural similarity, terlipressin, like arginine vasopressin, can block potassium channels in vascular endothelial cells and can cause sudden vasospasm. We believe, our patient had endothelial dysfunction due to uncontrolled type 2-diabetes and developed V1 receptor/potassium channel mediated spasm of right coronary artery. It should also be noted that the recommended dose of terlipressin is only 2 mg, whereas the present patient received 4 mg terlipressin; double than the recommended dose, which could also be an important cause of cardiac complications observed in the patient. One should know the right dose and side-effects of any drug before using it. 1. Lee MY, Chu CS, Lee KT, Lee HC, Su HM, Cheng KH, et al. Terlipressin-related acute myocardial infarction: A case report and literature review. Kaohsiung J Med Sci 2004;20:604-8. 2. Elzouki AN, El-Menyar A, Ahmed E, Elbadri ME, Imam YZ, Gurbanna BA. Terlipressin-induced severe left and right ventricular dysfunction in patient presented with upper gastrointestinal bleeding: Case report and literature review. Am J Emerg Med 2010;28:540.e1-6. 3. Medel J, Boccara G, Van de Steen E, Bertrand M, Godet G, Coriat P. Terlipressin for treating intraoperative hypotension: Can it unmask myocardial ischemia? Anesth Analg 2001;93:53-5, TOC. 4. Rosario R, Lalanne B, Lèbre P, Lepesan D, Martelet JP, Dupont M, et al. Myocardial infarction after injection of terlipressin for digestive hemorrhage. Gastroenterol Clin Biol 1996;20:712-3. 5. Morelli A, Ertmer C, Rehberg S, Lange M, Orecchioni A, Cecchini V, et al. Continuous terlipressin versus vasopressin infusion in septic shock (TERLIVAP): A randomized, controlled pilot study. Crit Care 2009;13:R130. 6. Douglas JG, Forrest JA, Prowse CV, Cash JD, Finlayson ND. Effects of lysine vasopressin and glypressin on the fibrinolytic system in cirrhosis. Gut 1979;20:565-7. 7. Okamura T, Ayajiki K, Fujioka H, Toda N. Mechanisms underlying arginine vasopressin-induced relaxation in monkey isolated coronary arteries. J Hypertens 1999;17:673-8. 8. García-Villalón AL, Garcia JL, Fernández N, Monge L, Gómez B, Diéguez G. Regional differences in the arterial response to vasopressin: Role of endothelial nitric oxide. Br J Pharmacol 1996;118:1848-54. 9. Marbán E. The surprising role of vascular K (ATP) channels in vasospastic angina. J Clin Invest 2002;110:153-4.